App Store chart-topping downloads of the hit game Pokemon GO have sent Nintendo's stock soaring, adding more than $7 billion to its market capitalization. However, the Japanese gaming icon is reportedly earning significantly less from app-related sales than Apple is from its App Store cut. The Pokemon GO title is free in the iOS App Store, currently limited to the U.S., Australia and New Zealand but expanding soon to Europe and Japan. 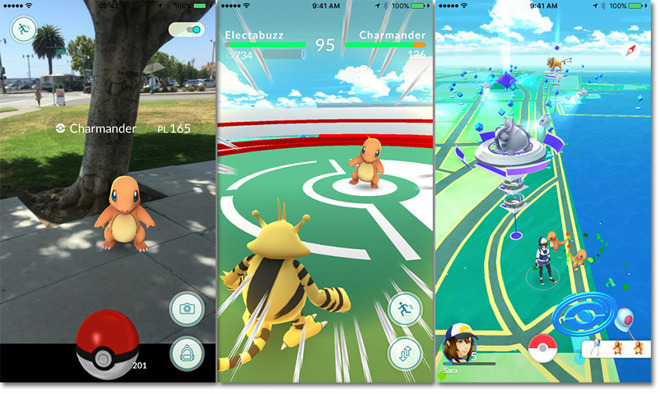 Players seeking to collect the game's pocket monsters can buy virtual currency via in-app purchases. Like other IAP, Apple collects an App Store cut of the proceeds. A report by Luke Kawa for Bloomberg noted that the game already has more active users than Snapchat or WhatsApp, having rocketed to the top of the App Store charts at a record pace. The report cited Macquarie Capital Securities analyst David Gibson, who noted, "As users build their Pokemon inventory, spending money becomes needed to store, train, hatch, and battle." Nintendo's belated foray into smartphone apps--via licensing one of its most popular gaming franchises--is expected to boost the company's net profits by as much as 15 percent. However, Gibson noted that its still unclear how much Nintendo itself would be earning from the game's success. The Pokemon GO title is based on previous work in augmented reality gaming developed by Niantic, formerly part of Google. Niantic was spun off into an independent company last October as Google restructured itself under the new name Alphabet. The company formed a $30 million partnership with Nintendo and the Pokemon Company, a joint venture developed to license Pokemon characters, which Nintendo owns a third of. Gibson stated that "we presume that out of every 100 units earned at the App Store, 30 would go to Apple, 30 to [software developer] Niantic, 30 to Pokemon and 10 to Nintendo." Apple earns a 30 percent cut of App Store sales and IAP, collected to help maintain and enhance the market for iOS software. App Store sales are a major part of Apple's Services segment, which experienced 20 percent growth in the March quarter, bringing in high margin revenues of $6 billion. A similar cut for Niantic helps fund the development of the game, while Nintendo and Pokemon earned a combined cut for the use of their intellectual property. As a joint owner of the Pokemon Company, Nintendo will benefit from the firm's appreciation. However, it is notable that while the game's success has immediately excited investors in Nintendo, the success of the title benefits Apple by a much larger amount, without involving an initial multi-million dollar risk in developing the software. Apple has increasingly sought to emphasize the value of its Services business to investors, particularly over the last two quarters where global economic conditions and unfavorable currency exchange rates have put a damper on the company's hardware sales. In April 2015, analytics firm App Annie noted that while Google served 70 percent more app downloads to its Android users, Apple's App Store earned 70 percent more revenues from iOS users. Apple's performance lead widened this year (as reported by The Telegraph, as Google Play downloads increased to become 100 percent greater than the App Store, even as App Store revenues grew to become 90 percent higher than Google Play. Apple's veritable lock on valuable customers can be tied to a better store experience with more attractive, exclusive titles, but is also closely related to the fact that Apple's statistically more affluent iOS users are more likely to pay for apps and IAP. Additionally, iOS users are more confident that apps they buy in the App Store will actually work on their devices. As noted by Twitter user Sumocat noted, many Android users trying to play Pokemon GO are finding that its novel use of augmented reality requires a functional gyroscope (along with a mainstream version of the OS; the game doesn't yet fully support the upcoming Android N or Apple's iOS 10 beta). Many cheap Android phones don't include functional gyroscope hardware, and many that appear to either aren't supported correctly, don't work right, or are fake. A variety of Android users complained that poor or missing gyroscope support "ruined the game for me." Users have been reporting the issue on models from Sony's Experia, HTC, Motorola ZTE to and, according to StackExchange "all Huawei smartphones." In 2014, the developer of dancing app Bounden noted similar issues in trying to get the gyroscope and digital compass to work on Android phones after first launching on iOS without those problems. Apple first added a digital compass to iPhone 3GS in 2009, and was the first phone vendor to build a three-axis gyroscope into a smartphone for iPhone 4 in 2010.